I have been waiting to share this recipe with you! The weather has been SOOOOO nice here, all we want to do is to be outside. Which means picnics, playing in the dirt (we are advanced, aren’t we? Anything to get away from technology is a “go” in my book), and firing up the grill. These days there seems to be something laid back about grilling, and being outside watching my kids play means I get two things done at once. And so, I have been creating healthy grilling recipes like crazy. This one, I’ll be honest, I tested over and over. And over…and, OVER! I tried the meatball on the skewer before grilling. Ehhhhh….too much hassle. The meatball would fall off a little too easily. I tried them smaller. Not good. They could fall through the grilling grates. Then, on the third try, BOOM (or, er….BAM) perfection. I wanted this to be a super-easy grilled meal for you to throw together. 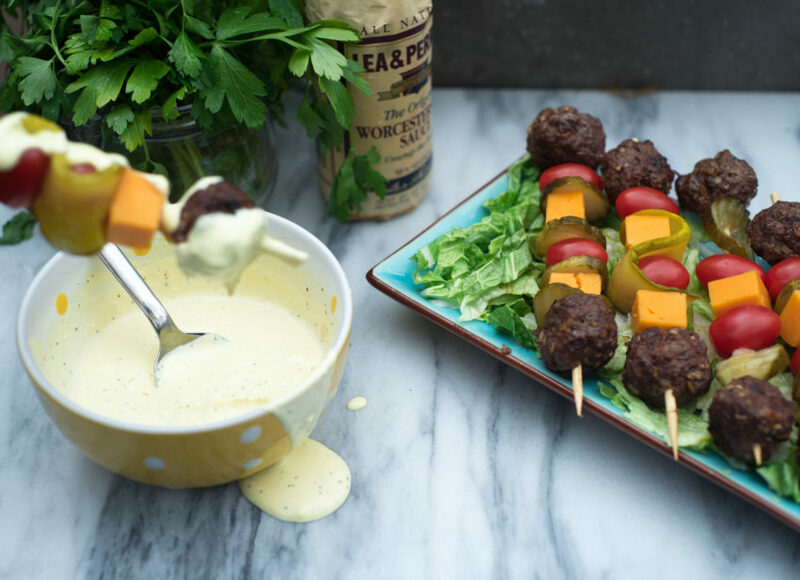 A perfect Mini-Cheeseburger Kabob with the Best Sauce Ever. Great for diabetics. Flavorful for everyone. No bun needed. Cheeseburger flavors accomplished. 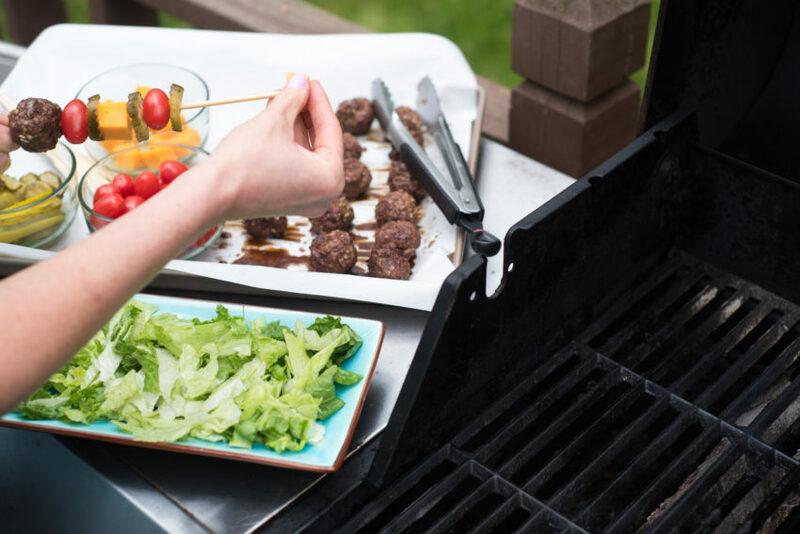 And that night, instead of Goldilocks and the 3 bears, I told my kids the story of Goldilocks and the 3 grilling kabob attempts (okay not really, but I felt like it). 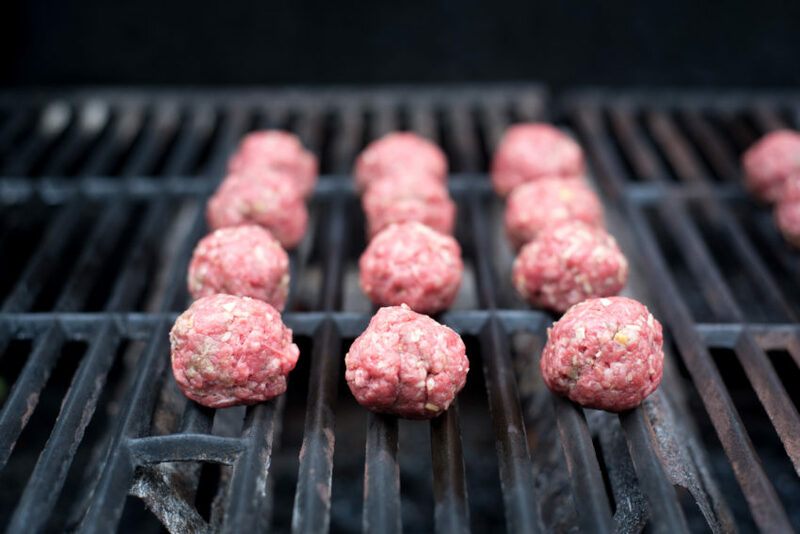 This will help them cook evenly, but also, make certain you get 16 meatballs. And I had to include this photo just because I LOVE IT! 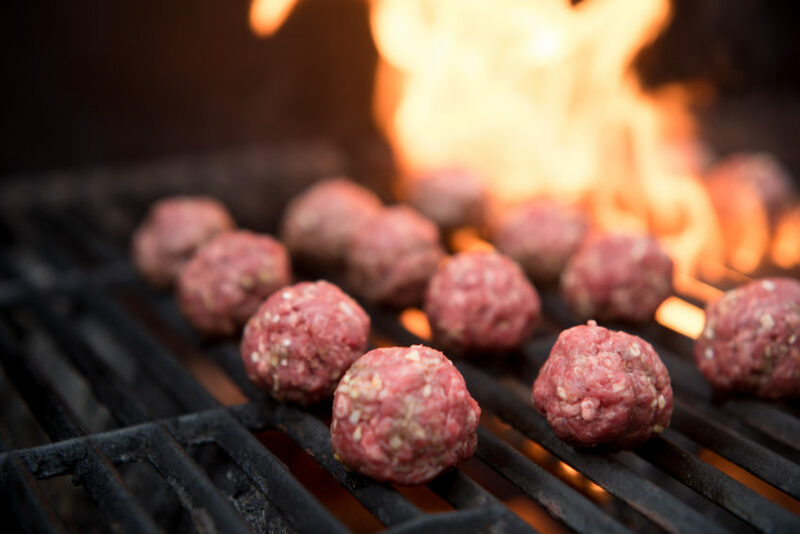 After the meatballs are done, LET THEM REST. This lets those juices redistribute, so that the tenderness stays in the meat itself. But while it’s doing it’s thing, splash Worcestershire Sauce over all of them. Trust me….this is the secret that makes all the difference. 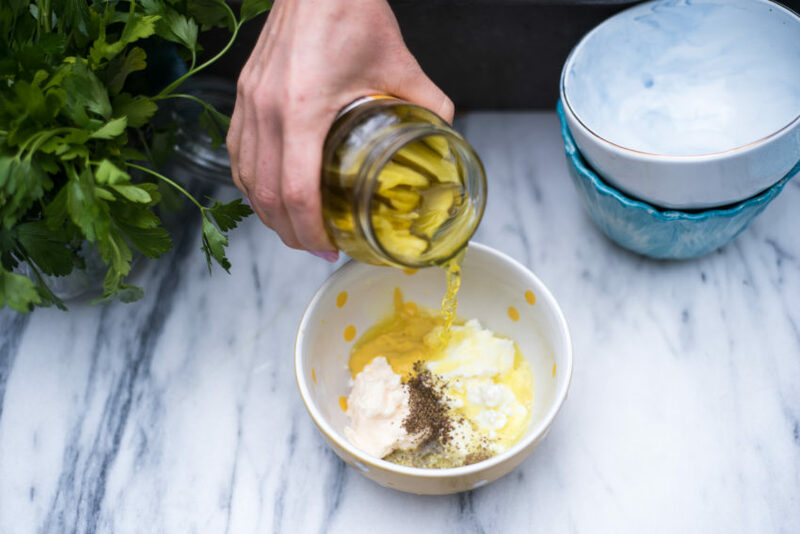 While they are waiting, make the yummy sauce: mayo, plain Greek yogurt, yellow mustard, celery seed. And then…dill pickle juice. I know it sounds different….but this stuff is addicting. Serve with the sauce, and you have a DELICIOUS healthy meal! No processed carb involved. If you know a diabetic who could use some flavorful meal ideas, please share this with them! Let me know if you make these – post a pic and tag me! Facebook: Annessa Chumbley, RD; Twitter @AnnessaRD, Instagram: @AnnessaRD; Pinterest @AnnessaRD. 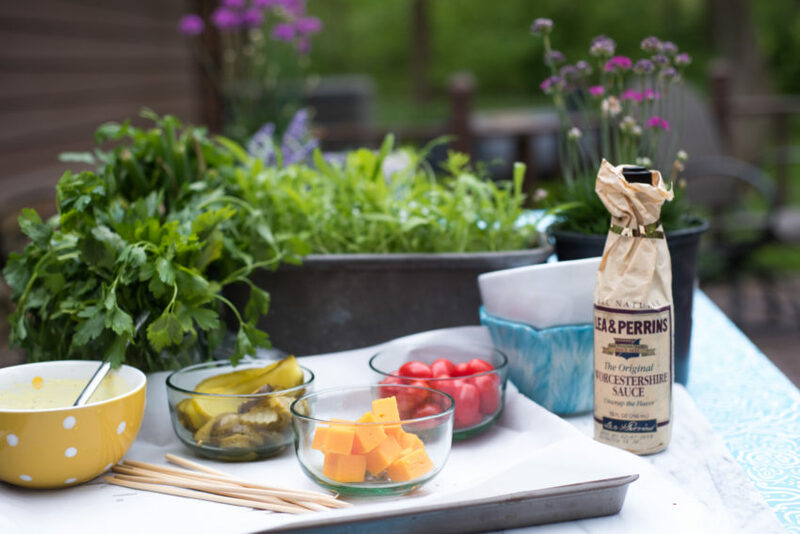 I created this recipe for Albertsons Safeway – I hope you enjoy it! 1. 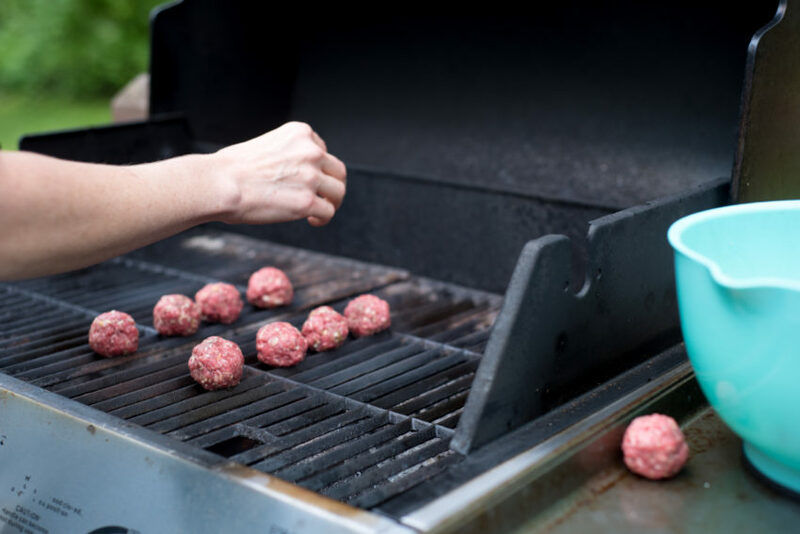 Prepare grill by brushing with oil and heating to medium-high. 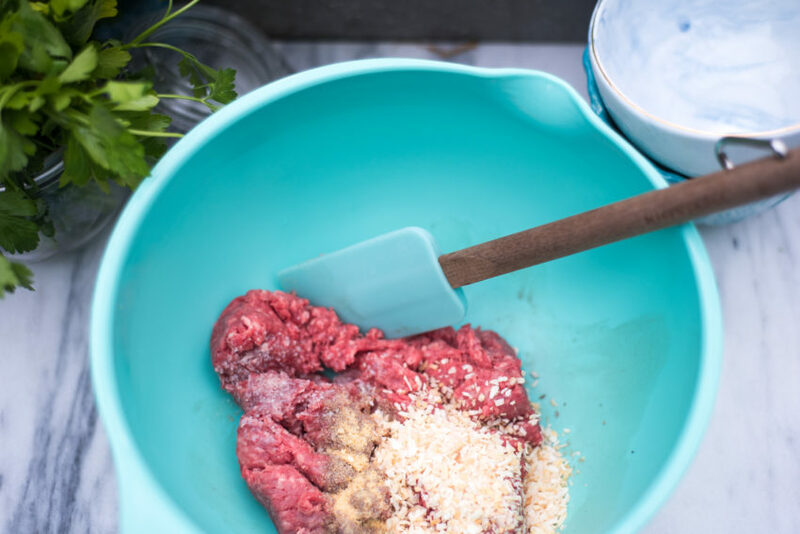 In a medium bowl, add beef, dried onion, garlic powder and salt. Gently mix with hands until ingredients are evenly incorporated. Shape into 16 (1 ounce) balls, firmly packed. 2. 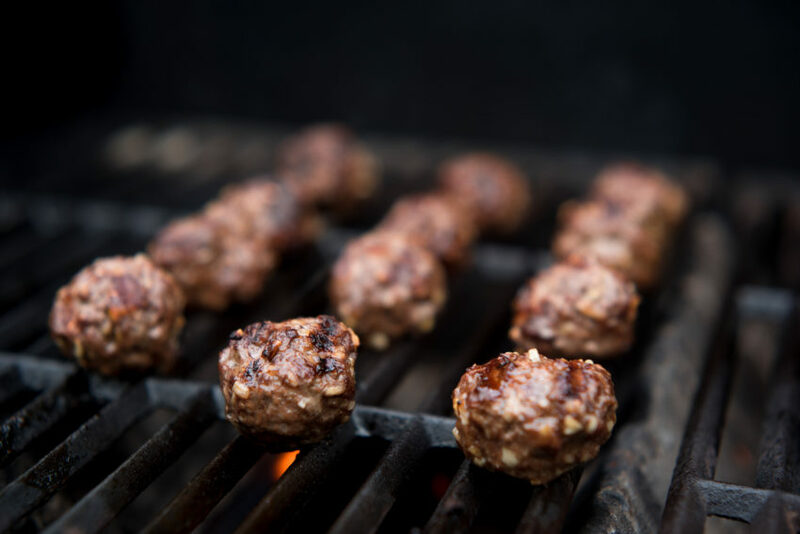 Place meatballs on the grill. Cook for 3 1/2 minutes each side, turning once, or until desired doneness. Remove from grill onto a plate. 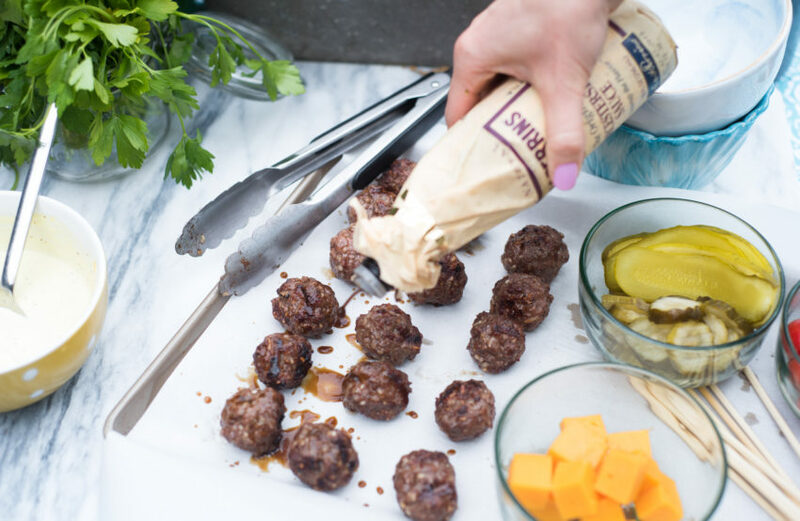 Sprinkle Worcestershire sauce over meatballs and let them rest 5 minutes. 3. 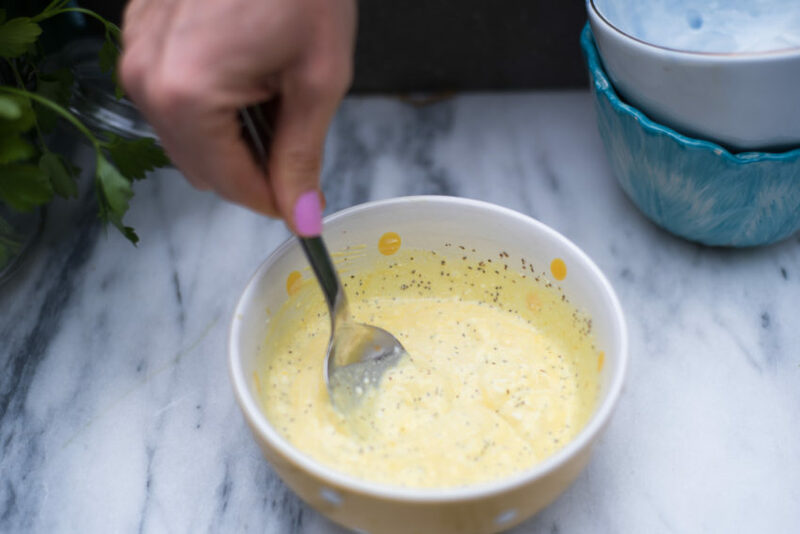 Combine all sauce ingredients in a small serving bowl. 4. 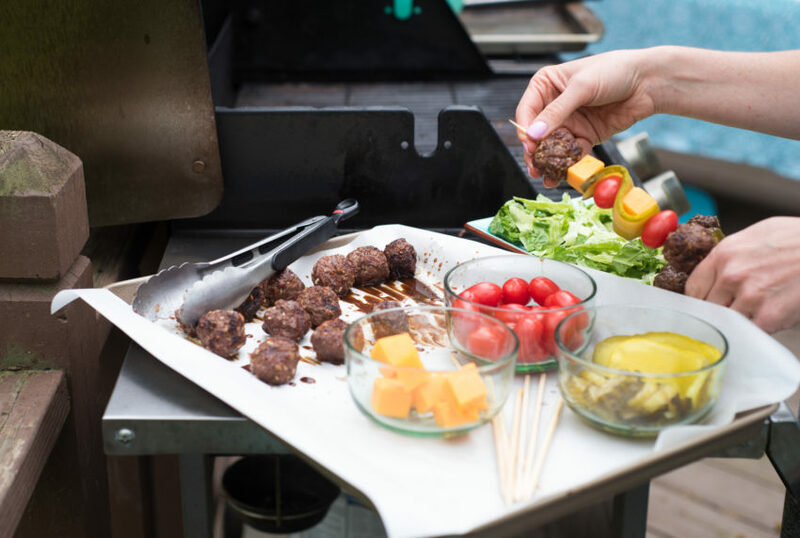 To make the kabobs: carefully skewer one meatball on, followed by a pickle, cheese cube, tomato, and another pickle, cheese cube, and tomato. Add on a second meatball. 5. 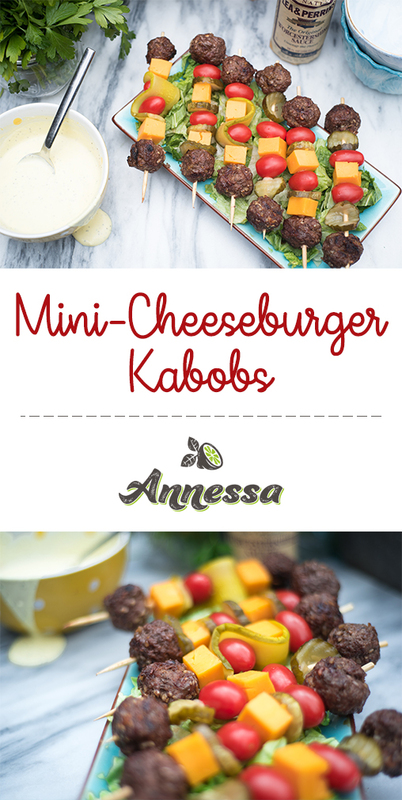 Serve kabobs immediately with sauce! Enjoy! 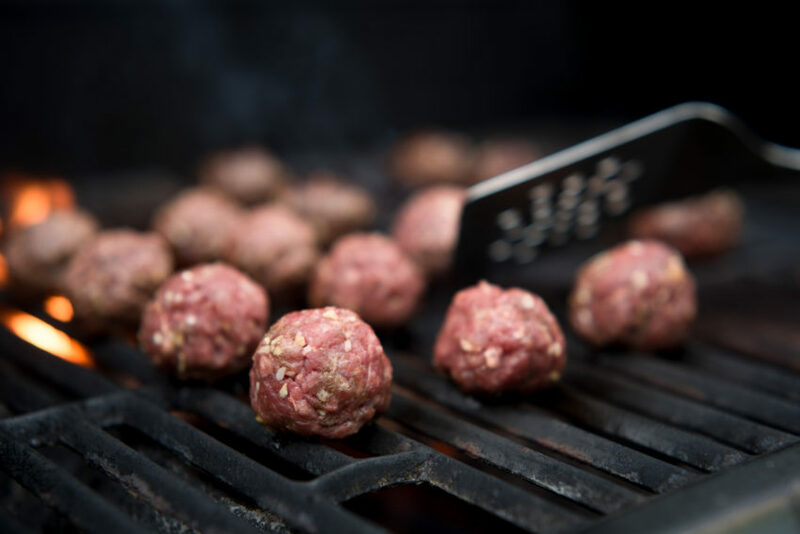 – waiting until meatballs are fully seared on the grill makes them easier to flip. Use a spatula to gently turn them over. – make sauce the night before and store in the refrigerator. It gets one step out of the way, and the sauce tastes even better the next day! 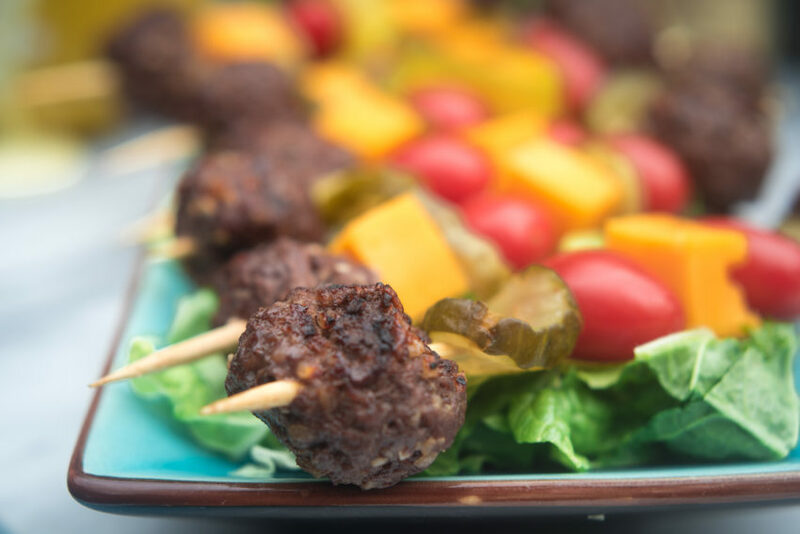 – use stacker pickles instead of pickle chips to create a different-looking kabob. Weave stacker on to skewer by folding it a few times. I am definitely going to try these. Thank you! You’re welcome, Pam!!!! I hope you like them!